Raspberry Scones - Let the Baking Begin! 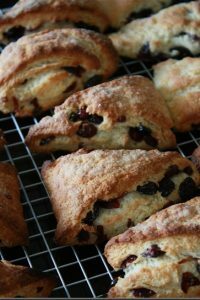 This is my second ‘go-to’ recipe for Scones. 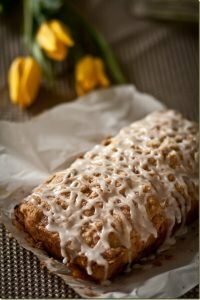 First one I ever found and really liked was the Blueberry Scone recipe. It’s wonderful, made without eggs, but the texture is different from these Raspberry Scones. 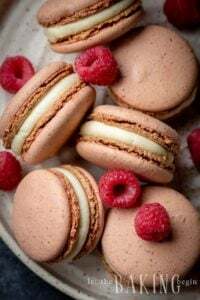 This one, has very crumbly and gentle texture, with slight crispiness on the outside and tang from both the raspberry glaze and the raspberries itself inside. Scones in general come together rather quickly, and this recipe is no different – just mix the dry, add the wet ingredients, mix, shape and bake, so you’ll be all done within 30 minutes. 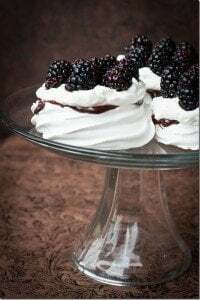 It’s always nice to have one of these recipes on hand, because when you need to satisfy your sweet tooth, you don’t want to fuss in the kitchen for 6 hours, with sweat dripping from your forehead. So try it, I guarantee you will love it! Lemon Madelines – Simple lemon cookies. Amaretti Cookies – Gluten and dairy-free cookies. Blueberry Scones – Scones with blueberries. In a food processor mix flour, sugar, baking powder and salt, for about 20 seconds. Add cubes of butter and process until the mixture resembles coarse meal. Whisk together egg, cream & vanilla extract. Add to the flour/butter mixture and allow the food processor to process everything until the dough starts to come together. Remove the dough onto working surface, bring everything together with hands and fold it together until it comes together into a dough ball. Roll it out on floured surface into a rectangle. Spread raspberries around. Roll the dough with the raspberries, starting from the narrower side, pressing the dough to extract air, as you roll. Keep rolling/stretching the roll out with your palms, until you get it to about 3 inches thick. Now cut it with a knife into 16 triangles, by cutting diagonally across the roll. Transfer the scones onto a baking sheet. Brush on the melted butter and generously sprinkle with sugar. This will give scones a crispy crust. Bake for 17 minutes, or until slightly golden. Transfer to cooling rack and allow to cool. Crush the raspberries, add lemon juice and the powdered sugar. Transfer into a ziplock bag. Snip off the end and drizzle tops of the scones in a zig-zag pattern. Alternatively, use a fork to drizzle the glaze on. Use any other berry you have on hand if you do not have Raspberries. 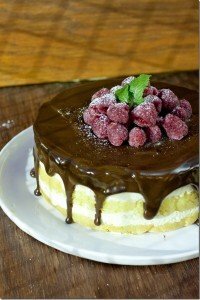 If using frozen berries, do not thaw before adding into the dough. Would it be any different if i would do in a mixer, and what speed??? You could do it in a mixer, just grate the butter/margarine into the flour instead of cutting it into chunks and try to mix it as little as possible, on low to medium speeds. As soon as it starts coming together, it’s enough mixing. Thanks so much for your feedback! I just made another batch today for our trip to the beach and I love how moist they are. What a pretty glaze! And all natural color I assume – from raspberries!